Did we save the best for last? 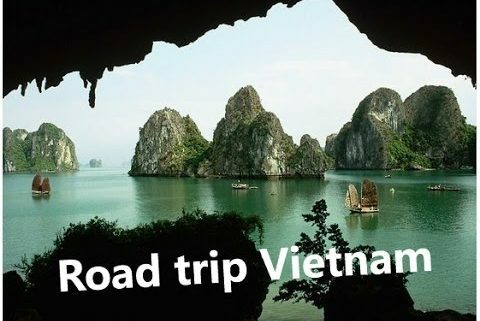 It’s tough to say for sure since every place on our 6 month, 4 country journey welcomed us with experiences we never anticipated and left us with memories to last a lifetime. By now we had been traveling for almost six months and, to be honest, we were tired and ready to get back home. 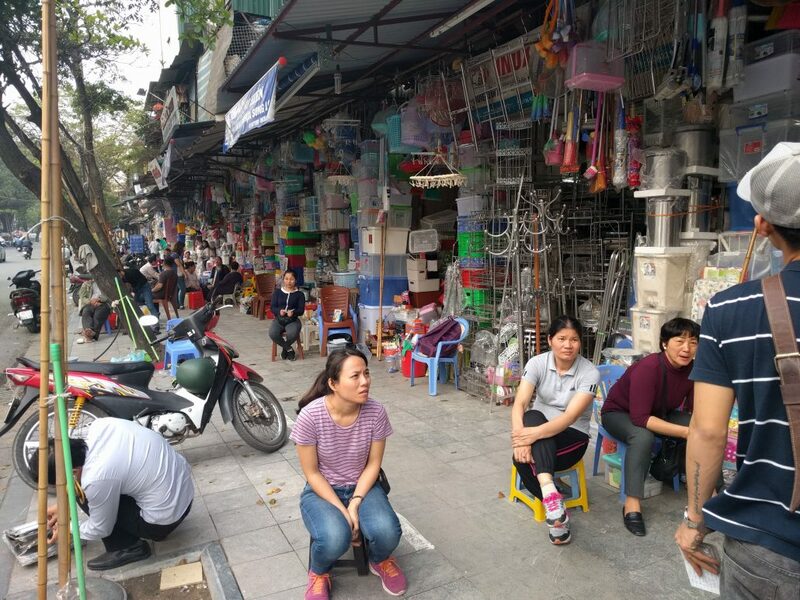 Our last blog is a brief overview of what we did in Hanoi which, from the start, had us mesmerized … at times confused … and always alert when crossing the streets to avoid being hit by motor scooters whizzing by! 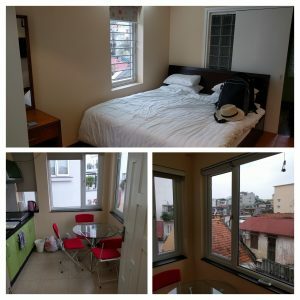 We chose an Airbnb property “In the Heart of Old Town Hanoi” in Hanoi’s Old Quarter and were delighted with our choice. Our host, Tuan Anh (Ben,) helped us carry our bags upstairs (several flights!) 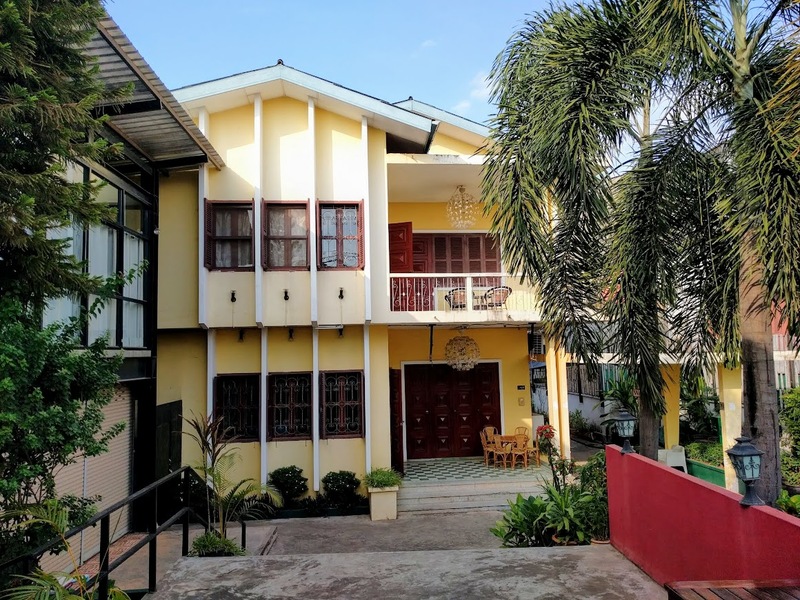 to our large, airy room with ensuite bathroom and a kitchen with cooktop, microwave and fridge as well as a table and chairs – a perfect place for us to work while enjoying a view of the city. It didn’t take long to find a place catering to locals as well as foreigners. Just look for a place with a line outside! 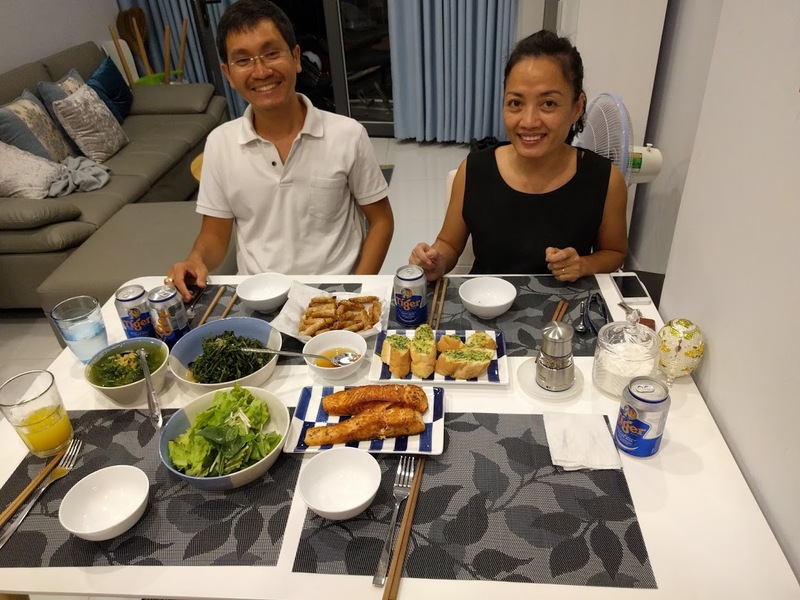 We sat at a table slurping our soup and talking with a gentleman from Wisconsin and his two adopted Korean sons who were visiting Hanoi for a week. 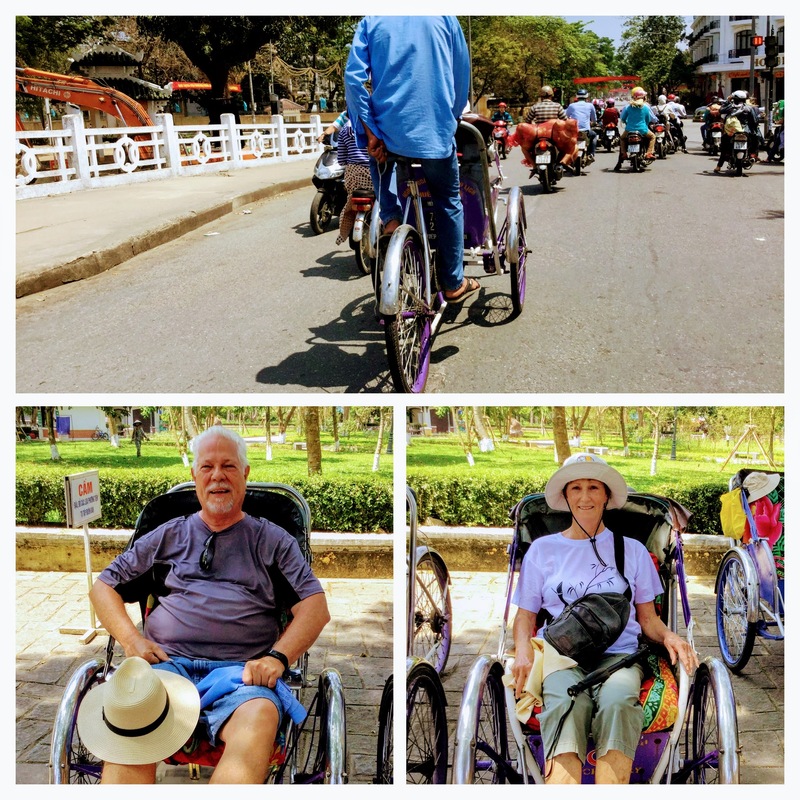 The only way to enjoy Hanoi’s Old Quarter is to walk which, in itself, is quite a challenge! We’ve mentioned the street traffic but walking on the sidewalk is just as difficult! You see, people live and work and eat on the sidewalks, which they consider an extension of their house. They park their motorbikes on the sidewalk. 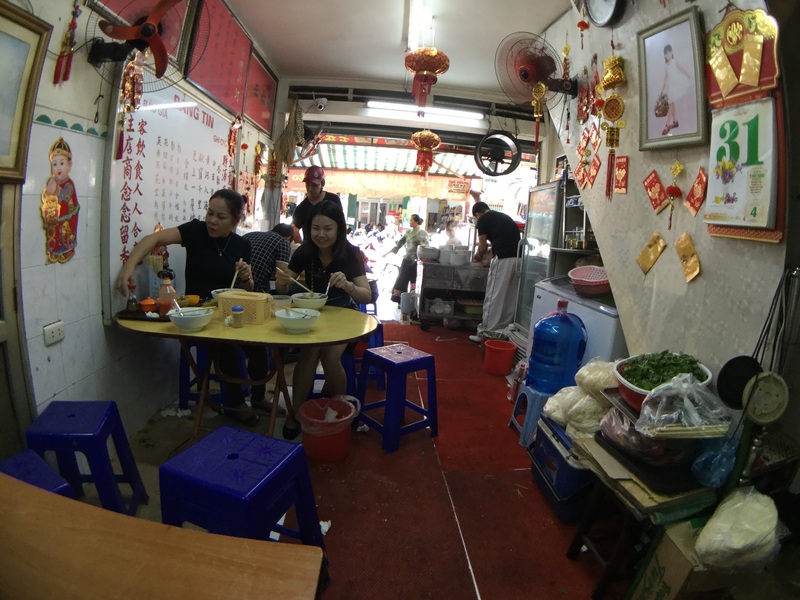 They sit on low stools at small tables and enjoy coffee or tea with friends on the sidewalk. They sell food and other necessities on the sidewalk. 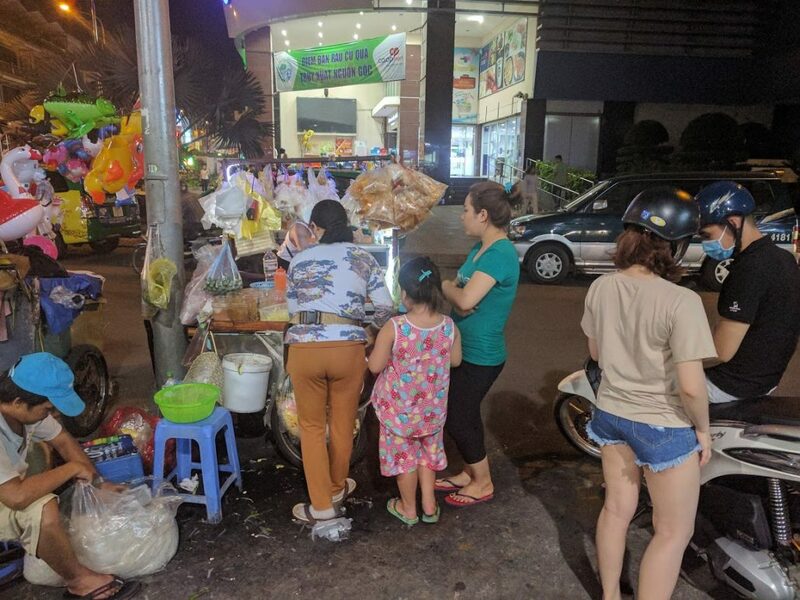 And in the evening the sidewalks turn into mini markets where customers drive up on their scooters and buy their dinner before heading home! Once we got over the need to get to our destination quickly, we found ourselves stopping to enjoy and capture moments in the mayhem! 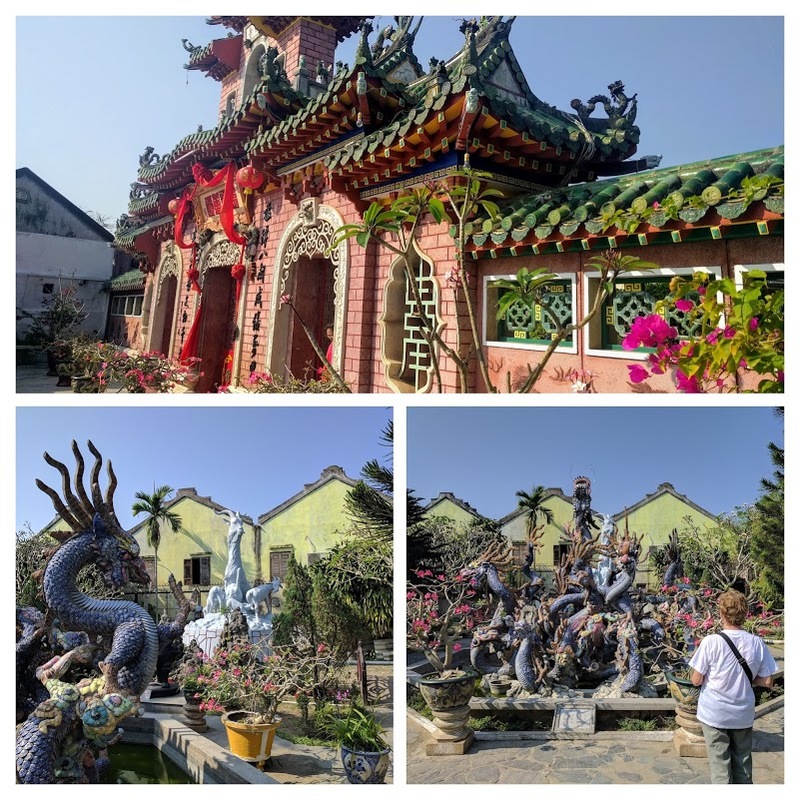 We saw beautifully decorated temples and pagodas crammed in between houses, enormous trees that must have been hundreds of years old. Vendor stalls filled with an incredible variety of fruits and vegetables, providing great photographic opportunities. 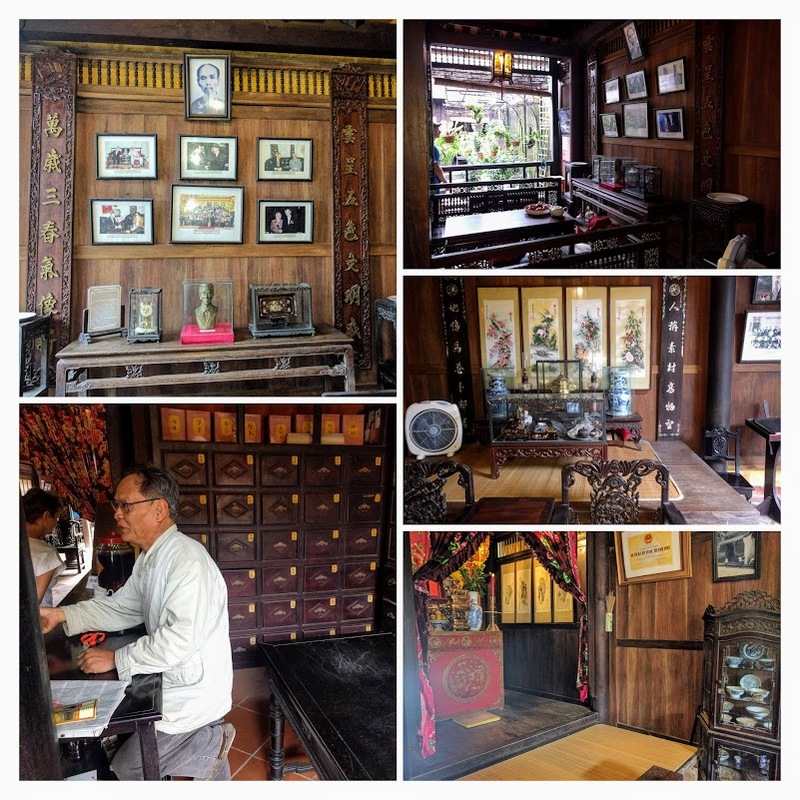 Hanoi’s Old Quarter has a fascinating history that spans more than 1,000 years. It’s been a capital since the 11th Century attracting skilled crafts people who formed cooperatives and set up shops on the same street producing similar products. The streets are named for the products produced and sold there. Check out this article by ThingsAsian for more information. So much has happened since we returned to the U.S. in April. Catching up on doctor and dentist appointments, reconnecting with family and a month long road trip to Michigan to spend time with Bill’s brothers and his 94 year young Mother in Michigan. And enjoy (for the second time) seeing 10,000+ street rods drive into the Kentucky Exposition Center in Louisville! 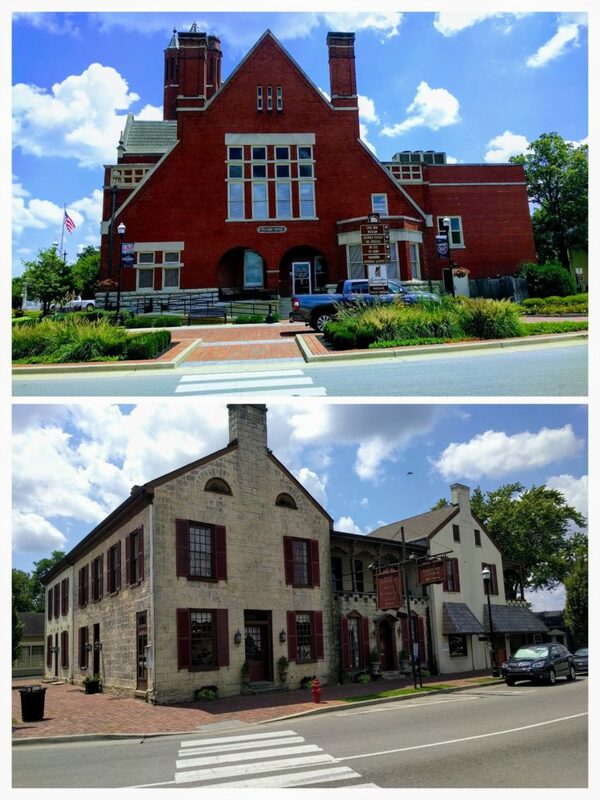 We did sneak in a tour of the Barton Bourbon Distillery in Bardstown. The sample tasted so good Bill decided he might switch from Scotch so we left with a bottle! We plan to return to explore this charming town in the not too distant future! 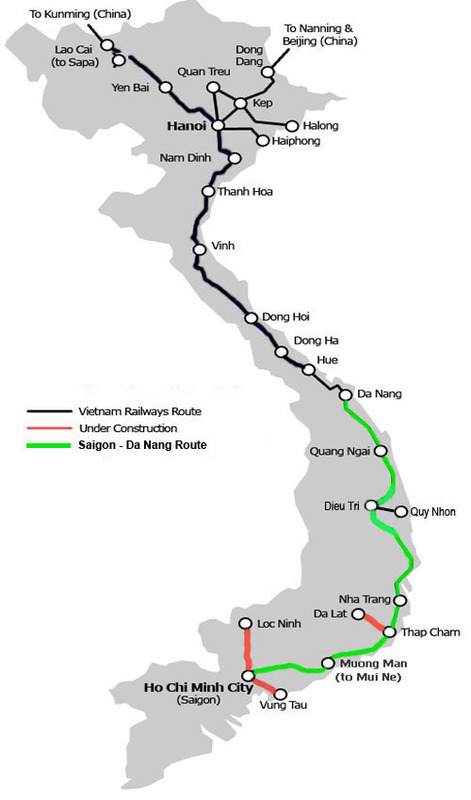 Maybe there was a reason for the delay in finishing our Vietnam story. 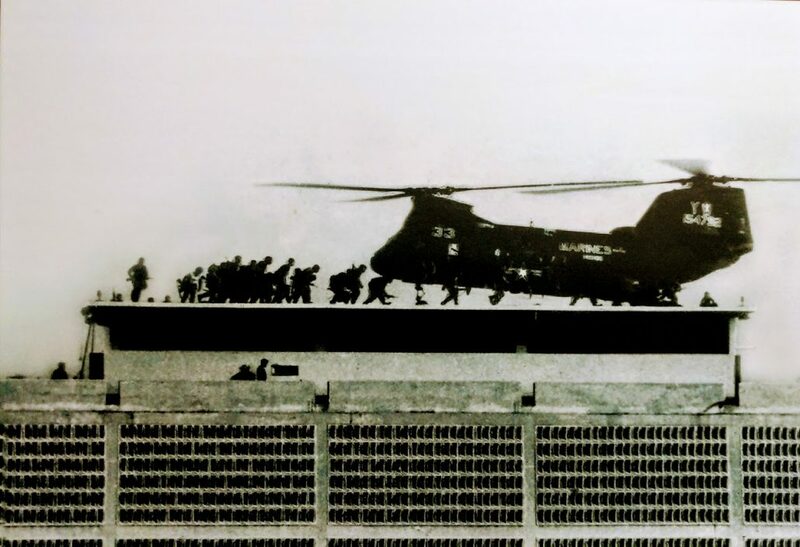 The Public Broadcasting Service recently launched The Vietnam War”, a 10-part 18-hour documentary film by Ken Burns and Lynn Novick. 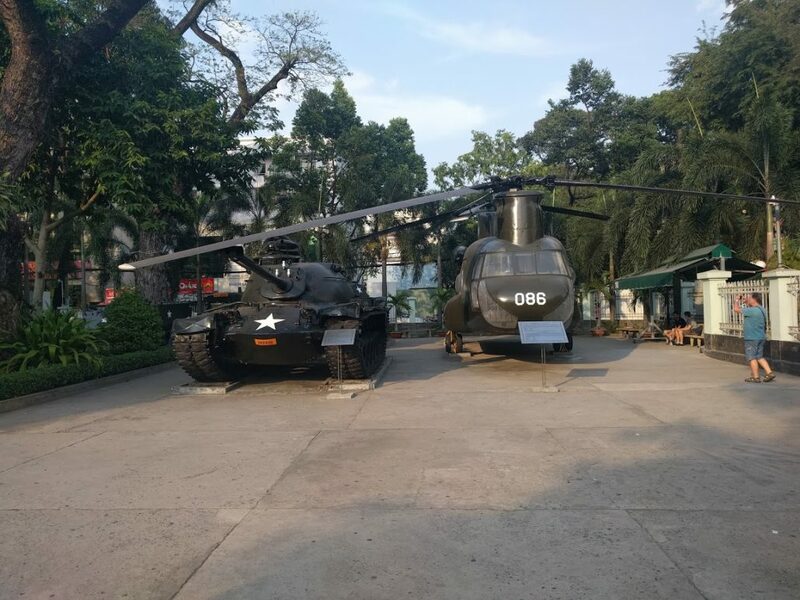 We watched every episode, saw some of the places we’d visited – like the city of Hue – the site of one of the longest and bloodiest battles of the war. We learned a lot from the series, were horrified once again by the violence on both sides and wonder if the human race will ever learn the lessons of history. We hope so. 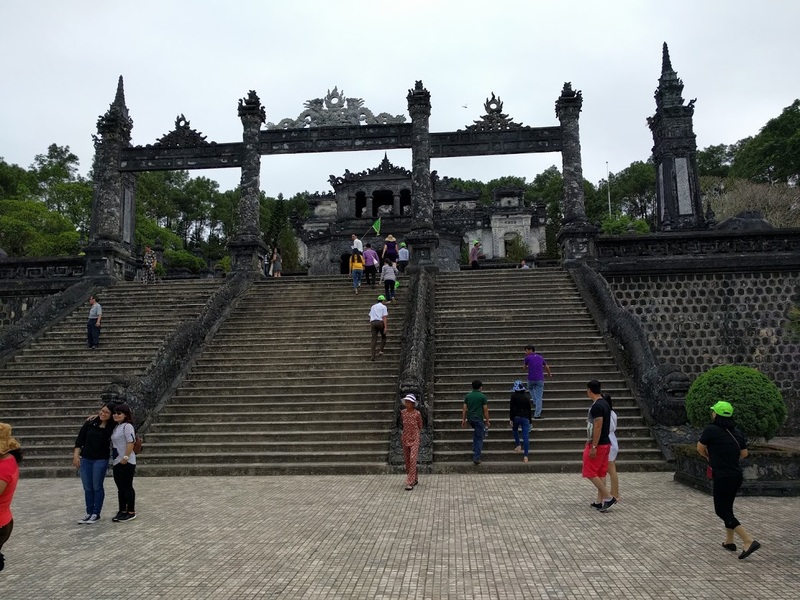 And now … back to our visit to the Hue Citadel in March. 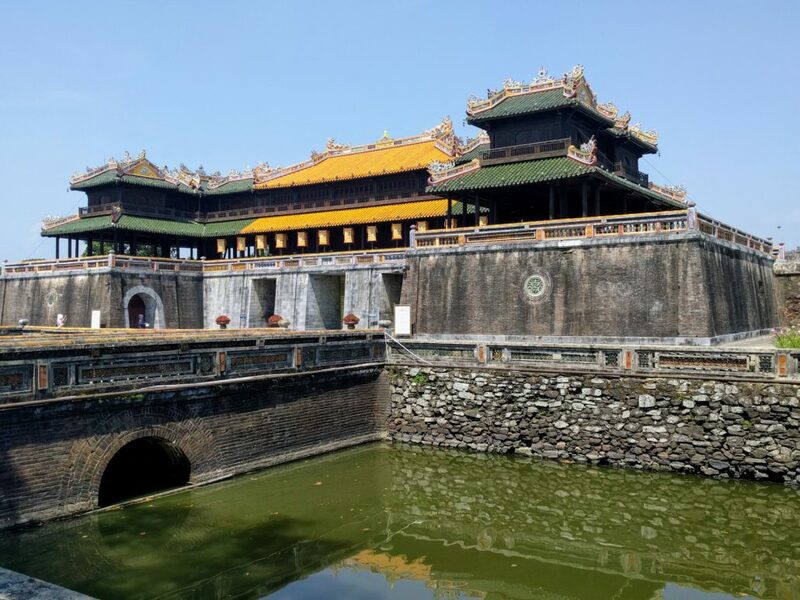 Our visit to Hue would not have been complete without spending time at the Citadel. Standing guard over the city of Hue, the Citadel is a rather grim fort-like structure topped with a massive flag pole displaying the huge red and gold flag of Vietnam. 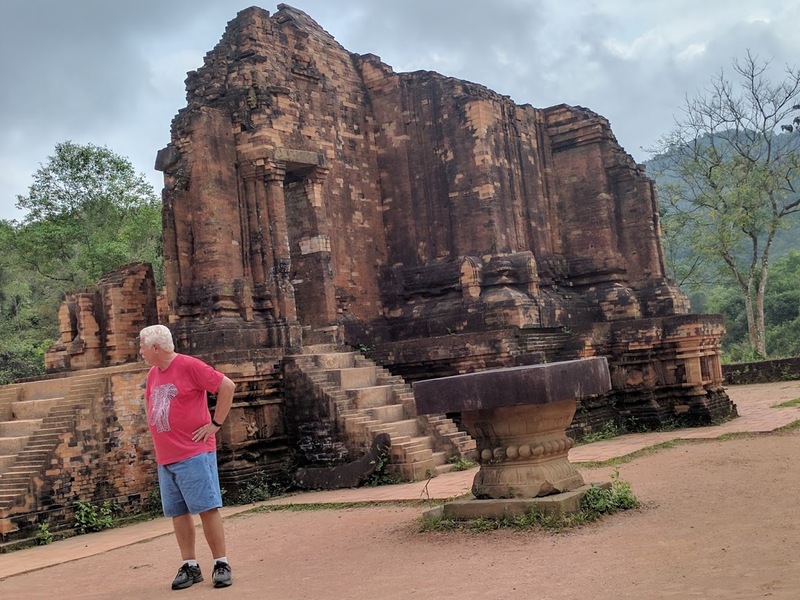 It was from here that the last of the Nguyen Emperors “ruled” during the 19th and 20th Centuries (under the very watchful eye of their French colonizers who conquered Vietnam in the late 19th Century). We decided to take a cyclo on the short ride from our guest house to the Citadel. On arrival we showed our entrance tickets and asked for a brochure but the ticket-taker merely shrugged and shook his head. Turns out there are none! 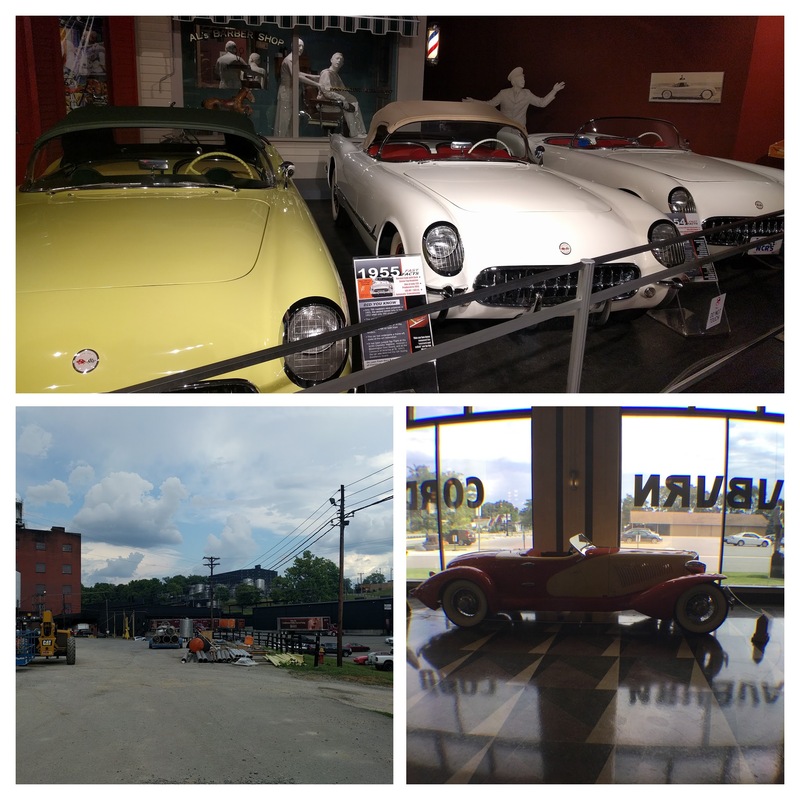 So much History … so little time to take it all in! 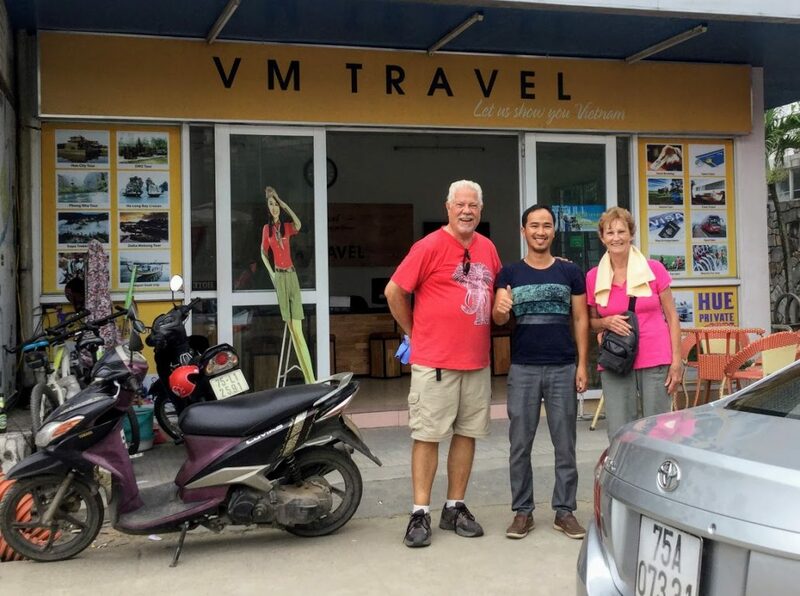 Fortunately, we had Phan Thanh Vinh, the owner and founder of VM Travel, to make sure we saw the highlights of the city without missing out on the vibrant social scene. 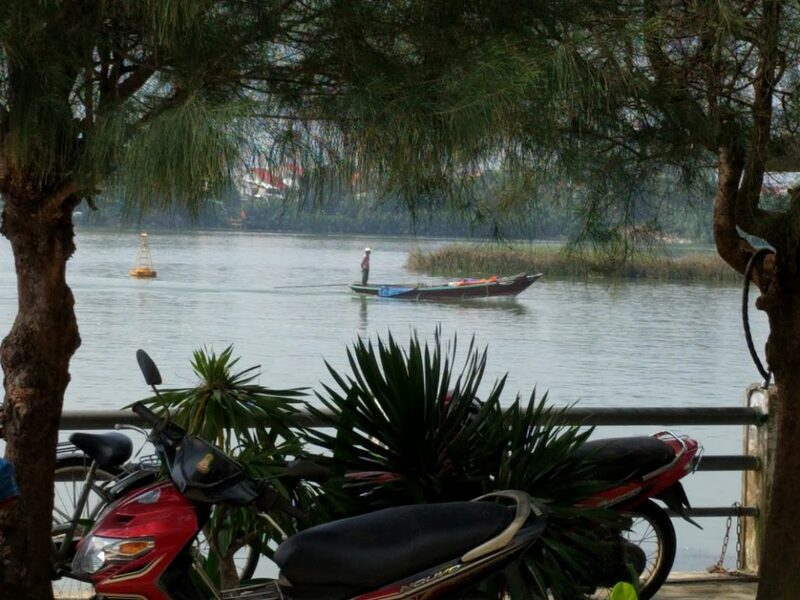 The day after we arrived, we met Vinh at a coffee shop (one of literally hundreds in Hue!) about a block from our hotel. He briefed us on VM Travel and the impressive range of services the company offers. 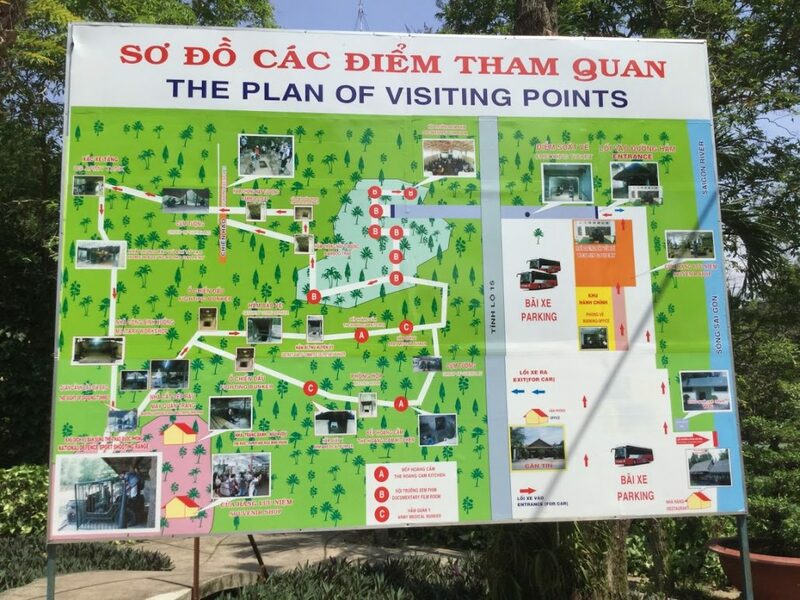 He also recommended an itinerary for us which included the Imperial City and two of the Nguyen Dynasty Tombs. We were ready to start exploring but first, a little information on Hue and the Nguyen Dynasty. 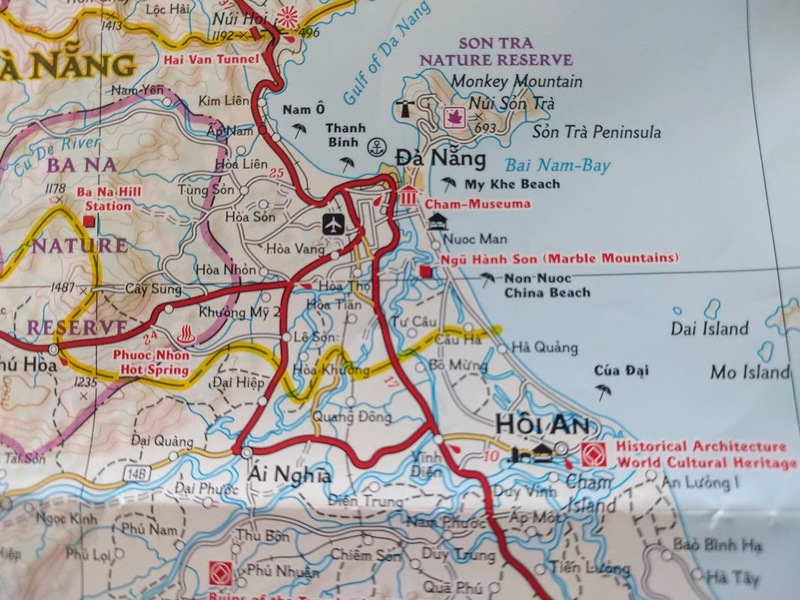 Located in Central Vietnam along the banks of the Perfume River, Hue was the capital of Vietnam between 1802 and 1945 under the rule of the Nguyen Dynasty (to pronounce Nguyen just change the Ngu to a W. That’s close enough!) The walled Citadel and Tombs are testament to the glory and opulence of this period. The last of the 10 Emperors “abdicated” in favor of Ho Chi Minh’s revolutionary government. 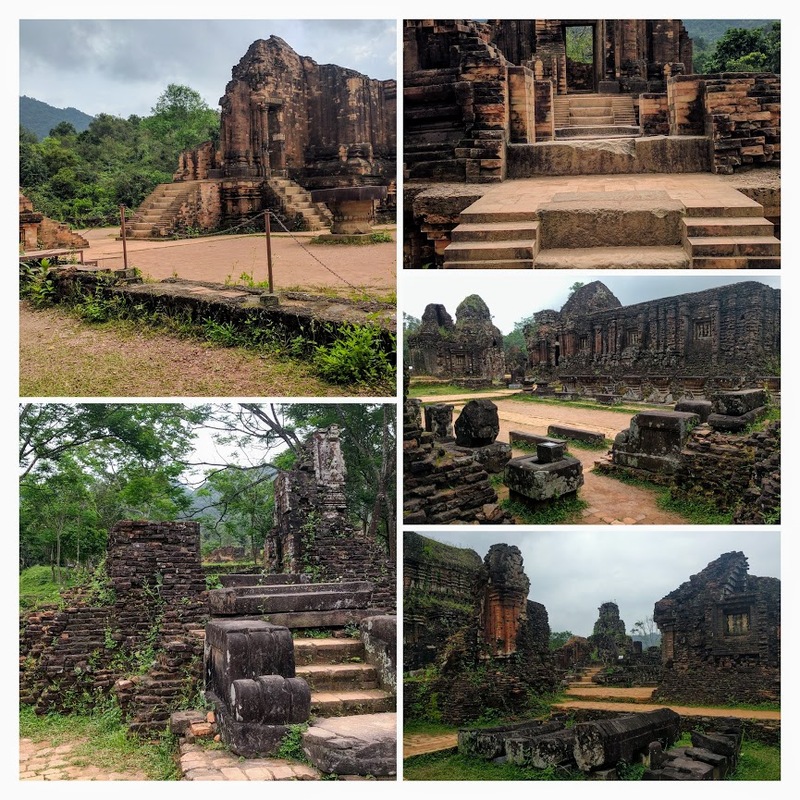 Unfortunately, the people and buildings of Hue suffered tremendously during wars with the French and, most recently, during the Battle of Hue,one of the longest and bloodiest battles of the Vietnam War. 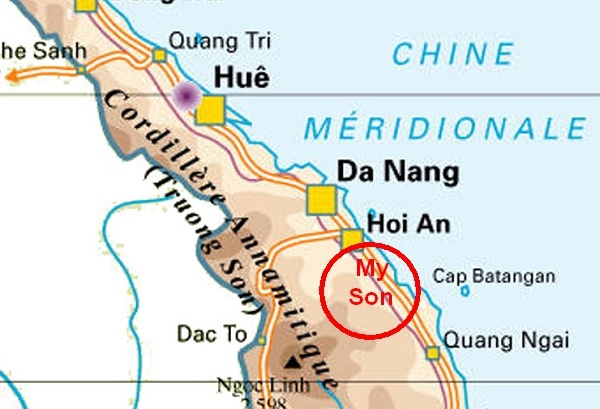 Located just south of the DMZ, Hue was overrun for a short time by the Viet Cong who proceeded to slaughter close to 3,000 people suspected of being sympathizers of the South. In retaking the city, the American forces had to use heavy artillery and air support, resulting in extensive damage to the ancient buildings. 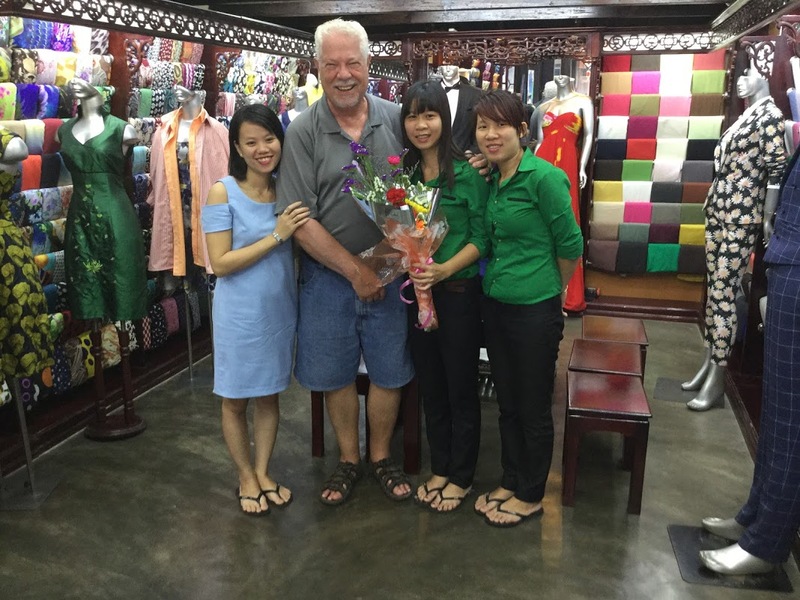 Despite this tragic past, we found the resilient people of Hue to be extremely friendly and welcoming. 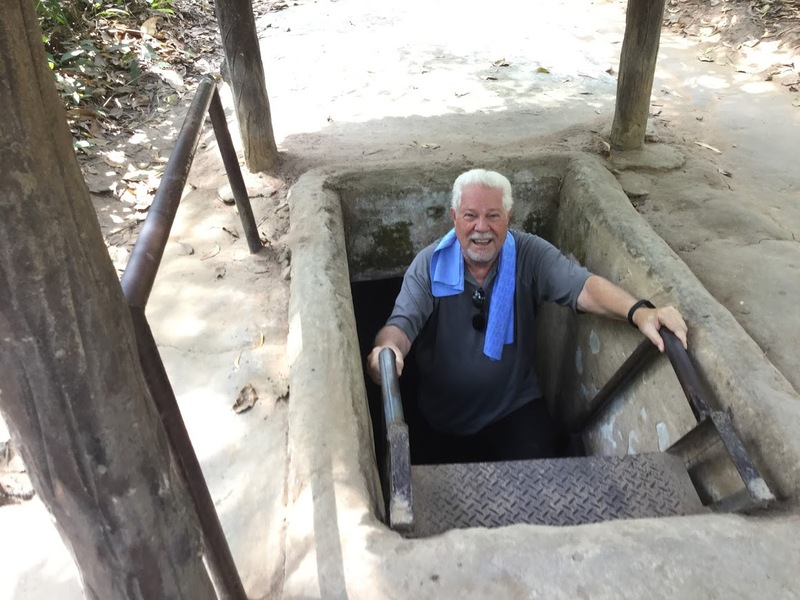 And so our first morning tour began when we met our English speaking driver, Son (pronounced Shoon), from VM Travel and were driven six miles (10Km) into the Chau Chu mountain area where the tomb is located. 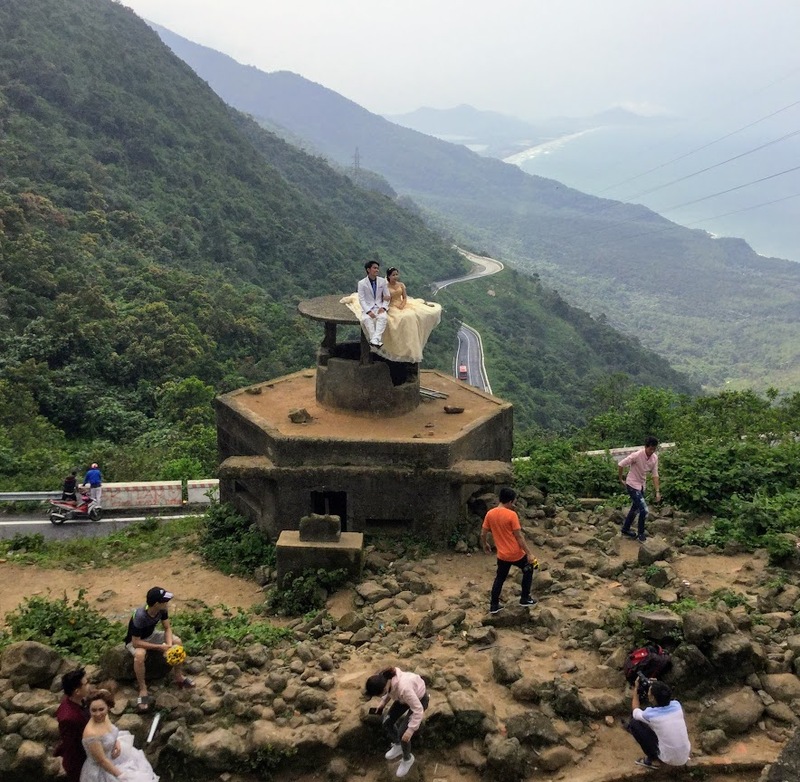 We think this mausoleum is a “Must See” because its architecture and location (on a hillside) is completely different from other tombs. Khai Dinh was the second to last Emperor of the Nguyen Dynasty, ruling from 1916 to 1925. A very unpopular Emperor, he was considered a puppet of the French and, more importantly, the construction of his grandiose tomb took eleven years to build, cost a fortune and resulted in a 30% tax increase for his people. This was not well received, as you can imagine! 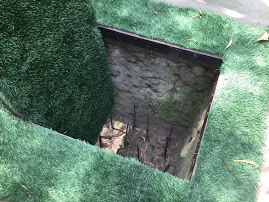 Son warned us that in order to appreciate the Tomb – and the view – we would have to walk up 127 steep steps to the 4th level but it would be worth it! 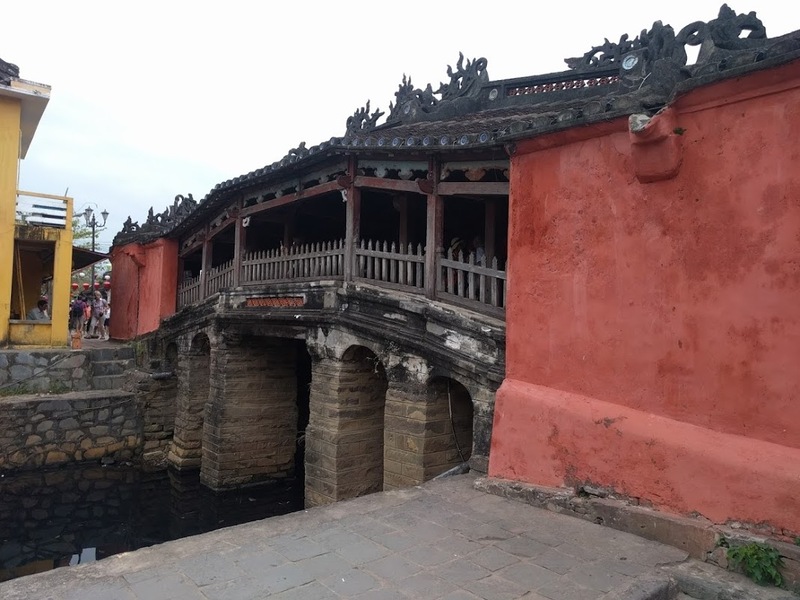 Built in a combination of Vietnamese and French architectural styles, the black concrete outer walls are somewhat grim and uninviting. However, as we climbed, the view from each level became more spectacular and once we entered the main building on the fourth level we were mesmerized! 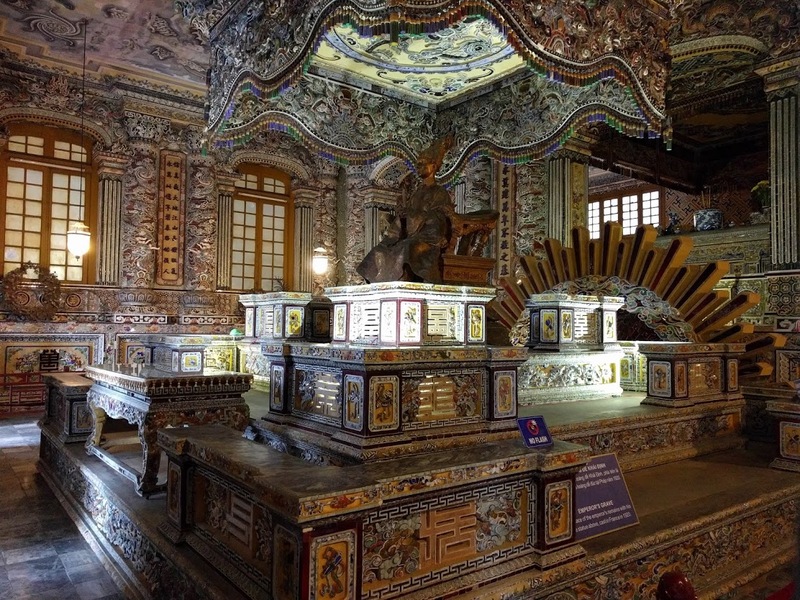 The walls and ceiling are completely covered with intricate inlaid porcelain murals (all done by hand, of course), and in the rear of the room, a gilt bronze statue of Khai Dinh sits on top of his grave. Wow! Such extravagance! 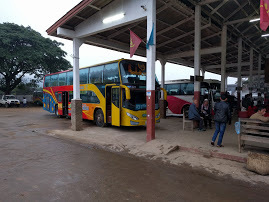 After ten days in Luang Prabang we boarded a VIP bus for a 6 hour drive south to a town called Vang Vieng where we planned to spend a few days before continuing on to Vientiane, the capital of Laos, known as the City of Sandalwood. This was our first bus experience and we found it to be reasonably comfortable except that Bill got dripped on occasionally from the roof hatch! The scenery would have been spectacular had we been able to see it through the rain and mist. 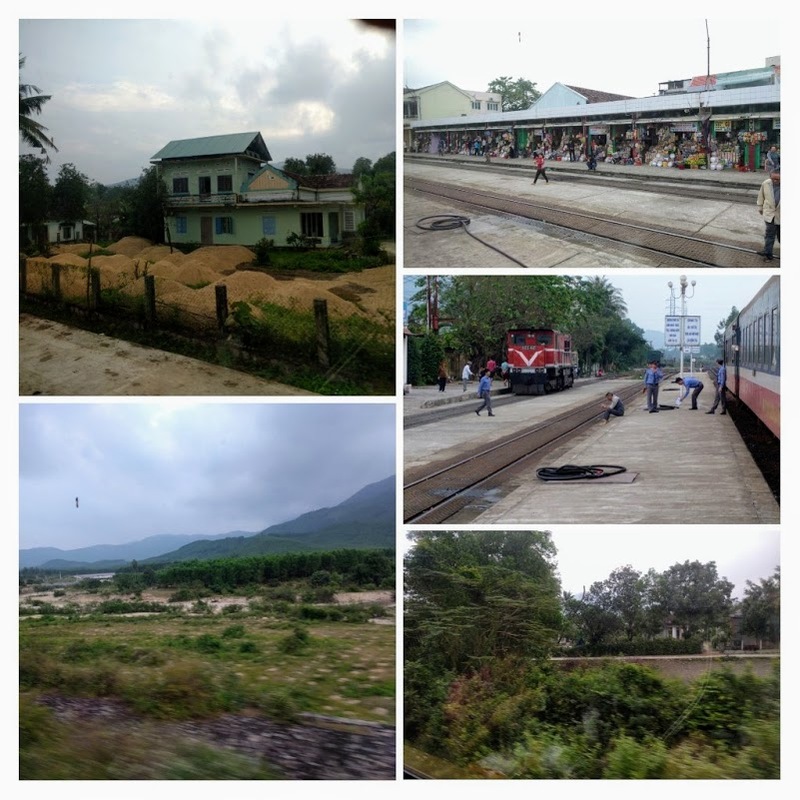 For most of the journey we traveled up and down mountains, with a couple of ‘comfort’ stops at remote villages. 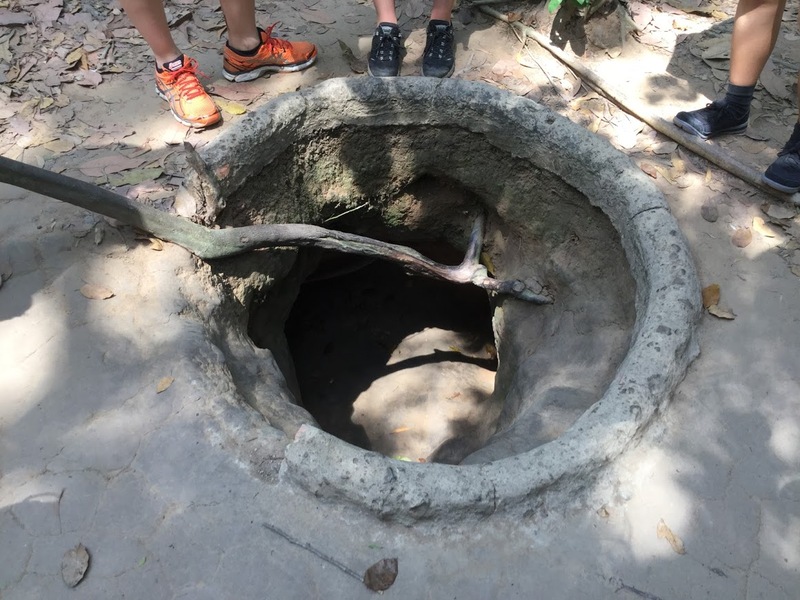 Priscilla made sure not to drink too much water to avoid having to use an Eastern style squat toilet! This is the main road running north/south in Laos and we encountered quite a lot of traffic – large trucks, buses, cars and motorbikes. The driver was good and drove slowly, navigating the potholes and mud that appeared on a regular basis. At some points the road was being slowly washed away and, of course, there are no guardrails. Interesting the things one learns when traveling! 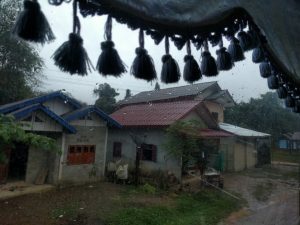 Again, rain curtailed our activities here in Vang Vieng but we walked around town and soon saw that we would not be going hungry here! 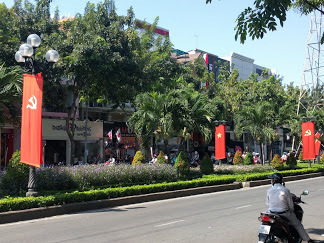 Every second place seemed to be a café, bar or restaurant featuring western as well as Lao food. Loud music continued well into the midnight hours but things have definitely calmed down since 2012 when the Government intervened in the partying and drug scene that had resulted in 22 deaths in 2011. 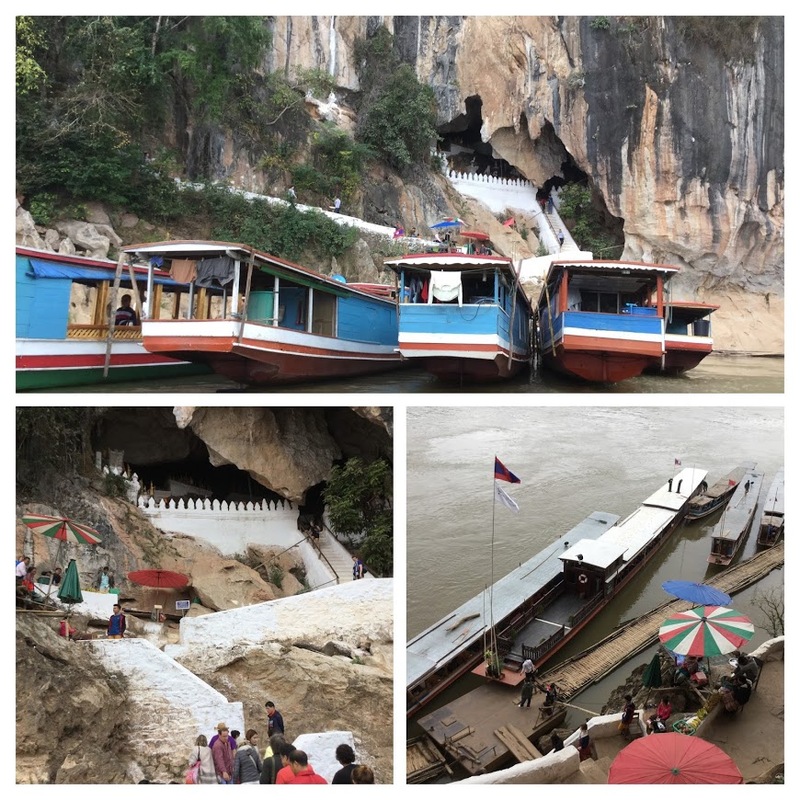 Along the Nam Song River travelers would party at make-shift bars then participate in wild water antics and tubing – a recipe for disaster. The main features of this area are the Nam Song River, the beautiful karst mountains that surround the town and several caves within easy distance. 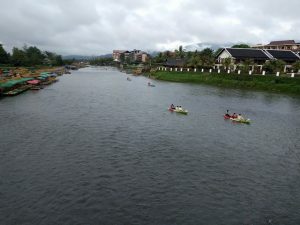 We managed to enjoy a walk along the river one afternoon when the sun finally emerged from the clouds but overall our three night stop here was for R&R. 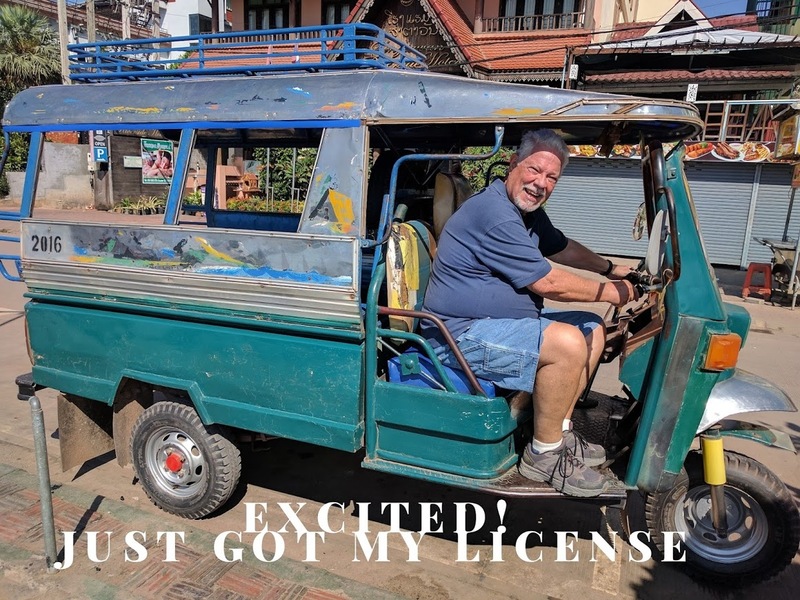 We decided to try a Minibus for our 4 hour drive to Vientiane, the Laos capital, and were picked up promptly at 9am. Our two bags were hoisted up on the roof (covered with a tarp!) and, being the first stop, we had our choice of seats. 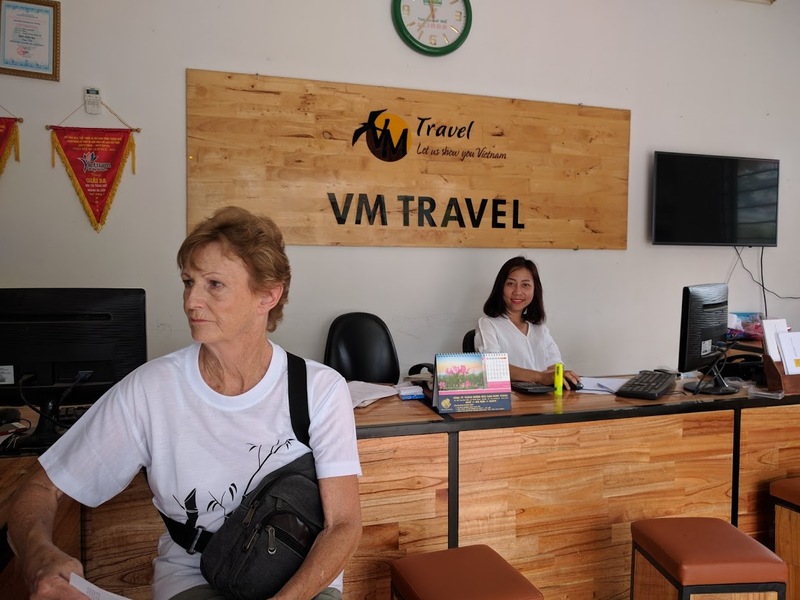 After stopping at several more guesthouses the minibus was ready to set off for Vientiane with 12 passengers. With the mountainous terrain behind us, our drive was more enjoyable although the driver lost no opportunities to pass other vehicles when he thought he had sufficient time and space! 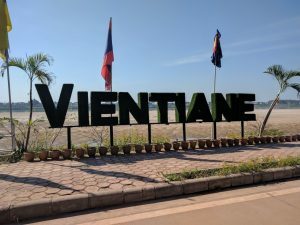 We knew we were nearing Vientiane when traffic became congested and we saw our first traffic light! 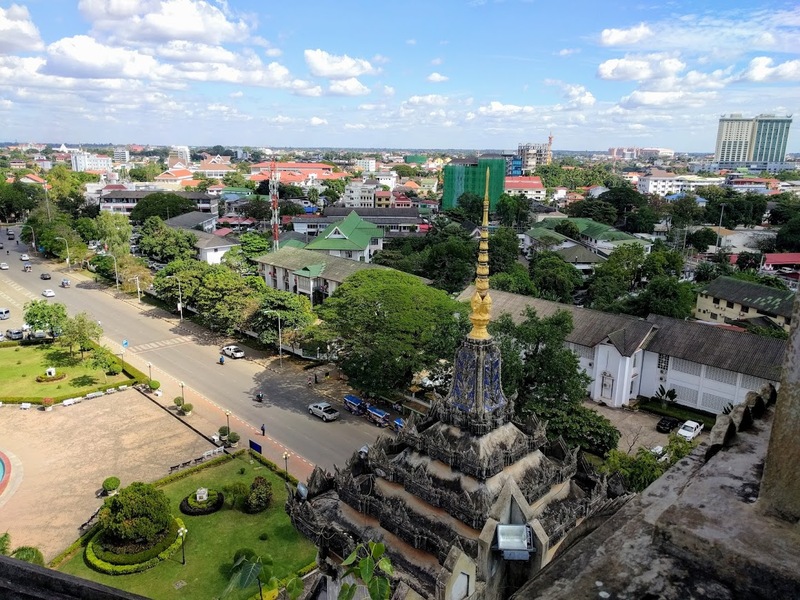 Originally known as “Wiang Jan” meaning “City of Sandalwood”, the French translated it to “Vientiane” and so it is known today. We opted for accommodation out of the city center on the Mekong River and found an Airbnb that seemed to suit us. We booked two nights, figuring we could always find another place if necessary and once we were settled in, we decided to stay. 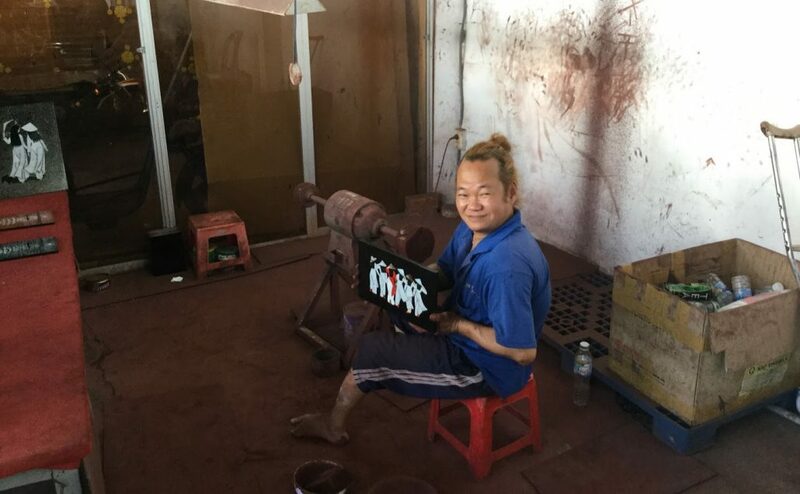 The owners are French Cambodians who returned to Vientiane after 35 years in France. 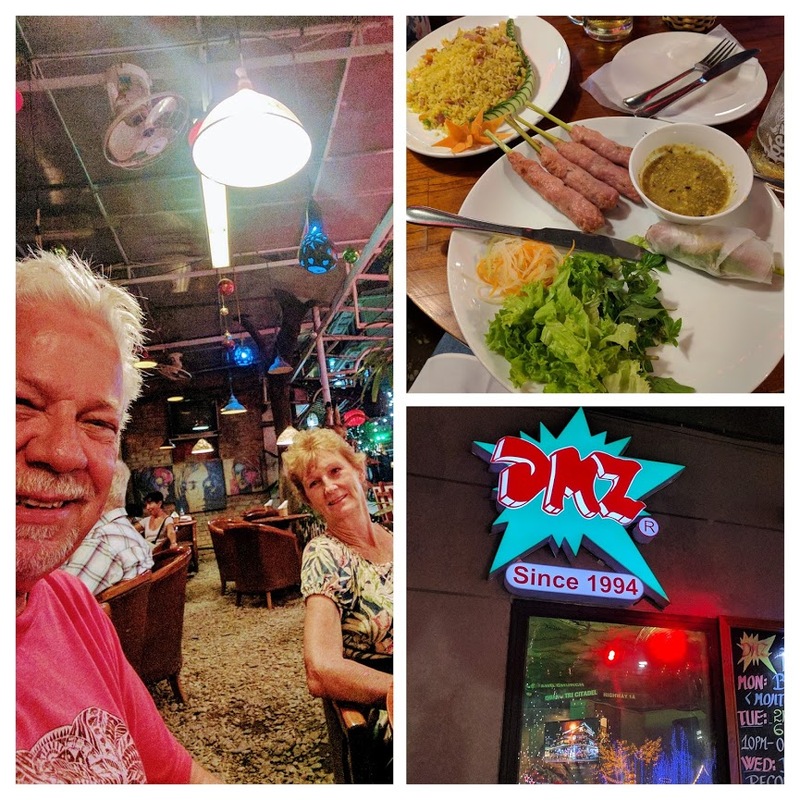 They are both talented musicians and most evenings we enjoyed listening to the two of them – and guests – playing the electric piano and singing Lao and popular western songs! We just felt like family! 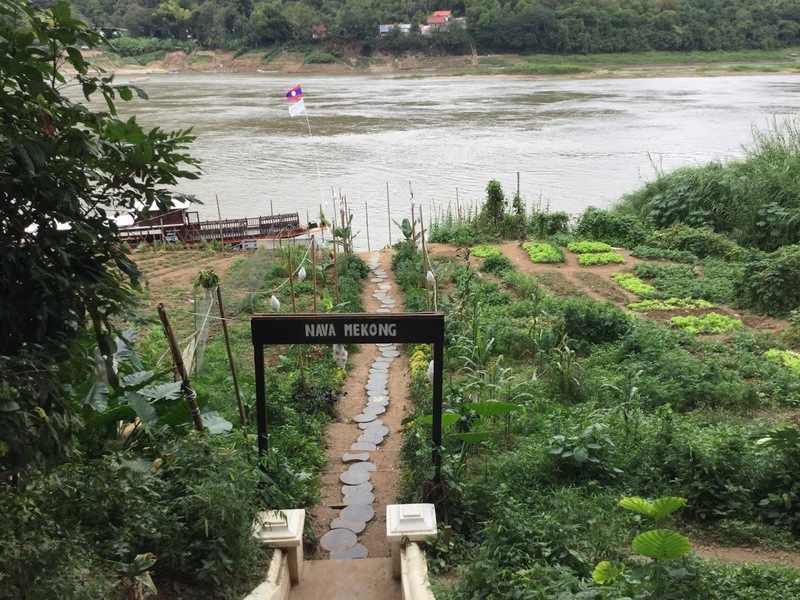 Across the street – and right on the banks of the Mekong – was their open air restaurant and we had several dinners there. Our host brews very good craft beers and has a collection of 1000 bottles of French wine! He suggested dishes for us to eat and they were superb! Eating outside under the stars and watching the moon reflected in the water adds a very romantic touch to a dinner! 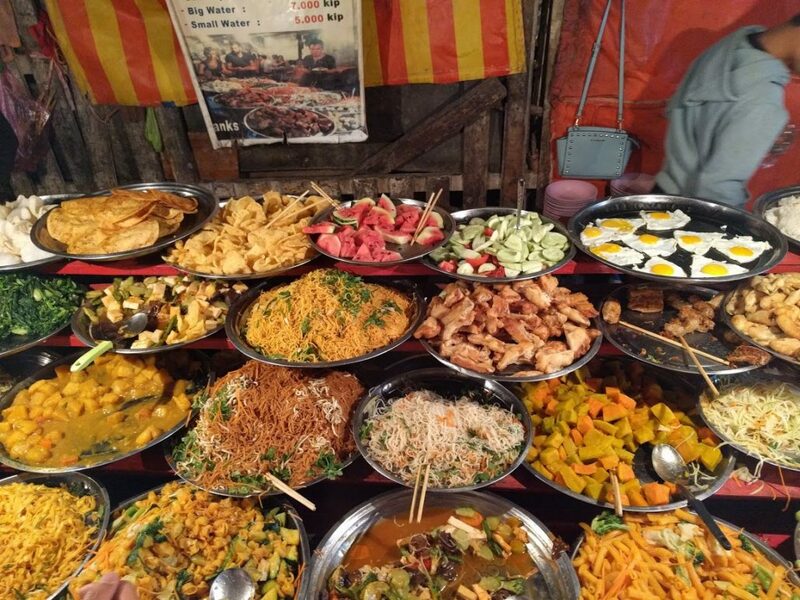 We were not too far from the Night Market and walked through it one night but, to be honest, Night Markets are pretty much all the same and unless you are looking for something in particular, we feel we’ve done enough of them! 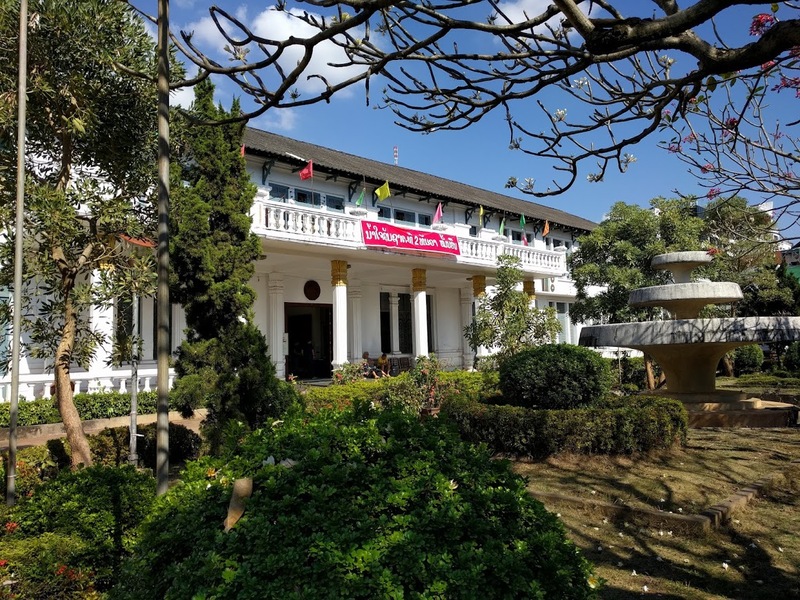 The Lao National History Museum is housed in an old colonial building that used to be the French Governor’s Mansion, built in 1925. Although it has a run-down appearance and needs major renovations and updating, there are several interesting historical exhibits including the Lao ancient Kingdoms, the various foreign invasions and Lao ethnic people and culture. 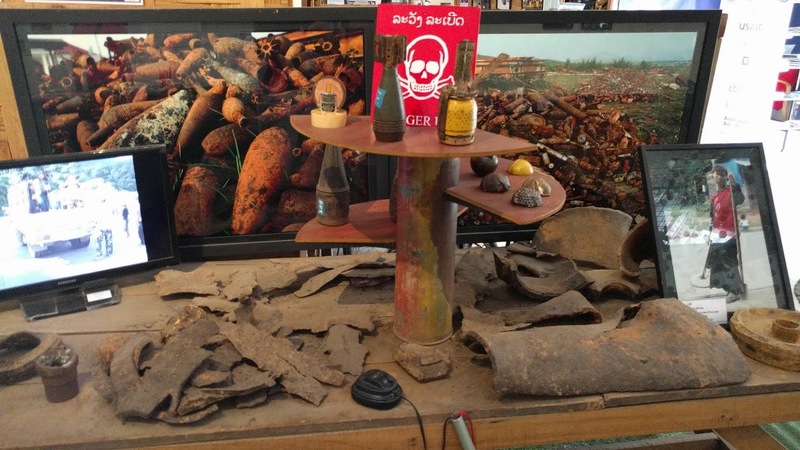 The display featuring the Plain of Jars was very interesting. Researchers are still trying to discover the purpose of the jars. One theory is that they might have been used by Bronze age people as burial urns, another for brewing alcohol. As we expected, there was a lot of propaganda about the Imperialist Americans and the glory of the Communist Party which rules to this day. 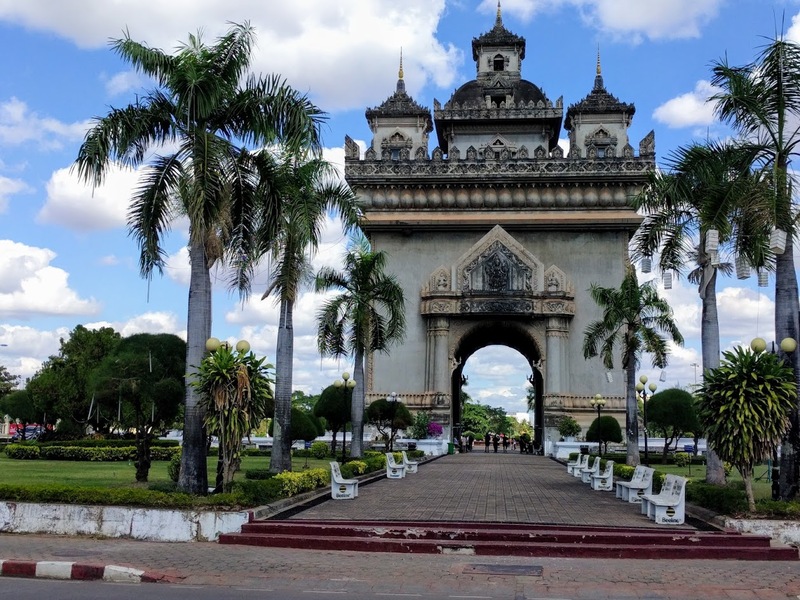 Before leaving Vientiane we climbed to the top of this Arc de Triomph “look-alike”. The views show the contrast between beautiful buildings (probably Government departments), Wats and Monasteries and the older, crumbling, Colonial style buildings as well as the small Lao style houses and stores. Set in beautiful gardens, the monument is dedicated to those who fought for Independence against France. Apparently, the United States provided funds and cement to construct an airport, however, the monument was built instead! 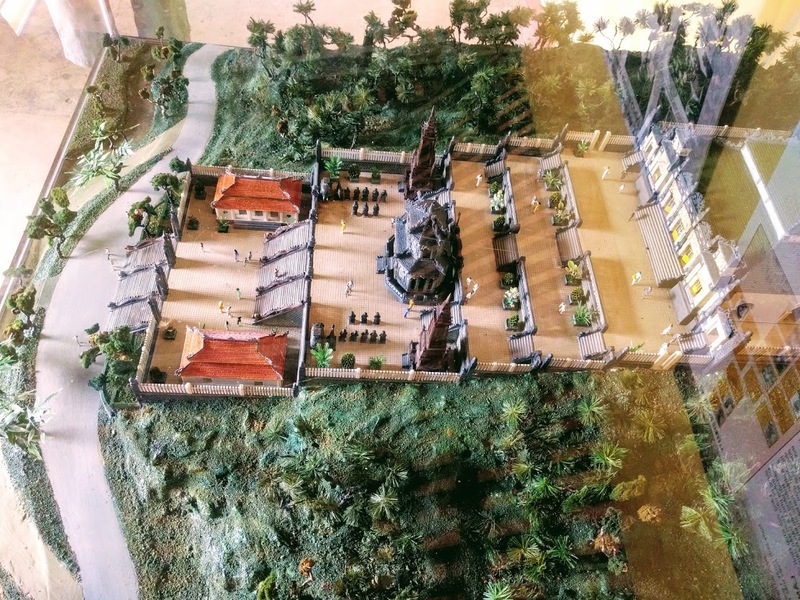 The Laotian design sets it apart from the Paris monument. And so our week in Vientiane, Laos, came to an end and we boarded our flight to Siem Reap, Cambodia, to visit the UNESCO World Heritage site of Angkor. 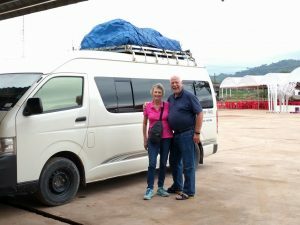 Saying goodbye to our friends in Chiang Mai on January 1st, we boarded our plane for Luang Prabang, Laos, the next stop in our Southeast Asia journey. Our flight took us over heavily forested mountainous terrain and we landed at a small airport that reminded us of Orlando Airport in the “old” days when we walked across the tarmac to the terminal! Visa and Immigration formalities took a while but went smoothly and we left there with a 30 day visa at a cost of USD $35 each. You are required to pay in US dollars and change is given in US dollars. A shared taxi ride into town took about 15 minutes, dropping people off at different hotels or guesthouses. 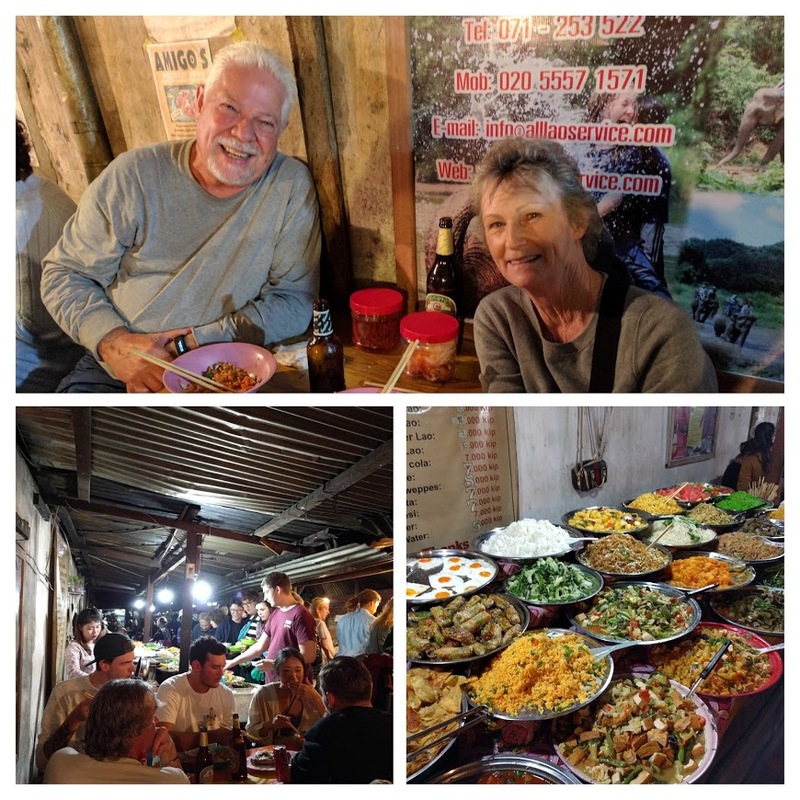 Although it was almost dark by the time we were settled in our guesthouse on the Mekong River, we set out to explore the surrounding area and find a restaurant for dinner. The streets were almost deserted and we walked in the middle of the road without fear of being run over! It was quite an eerie feeling after the hustle and bustle of Chiang Mai! We later found out that the town closes down completely by 11:00pm! Laos is a landlocked country bordered by Thailand in the west and southwest, Myanmar (Burma) and China to the northwest, Vietnam to the East and Cambodia to the southwest. 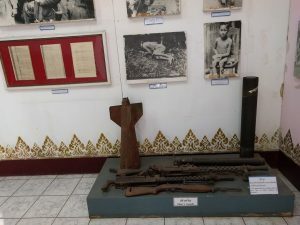 The country is officially known as Lao People’s Democratic Republic (PDR) and, since 1975 has been a One Party Socialist Republic, governed by a Communist Politburo controlled by Military Generals. 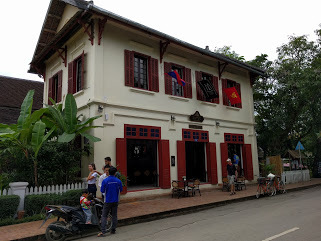 The Hammer and Sickle flag flies alongside the Laos flag. 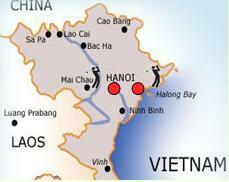 Laos was a French protectorate from 1893 -1953 and much of the French influence is evident today throughout the country. Unlike Thailand, they drive on the right hand side of the road so we had to get used to looking the other way before crossing the road! 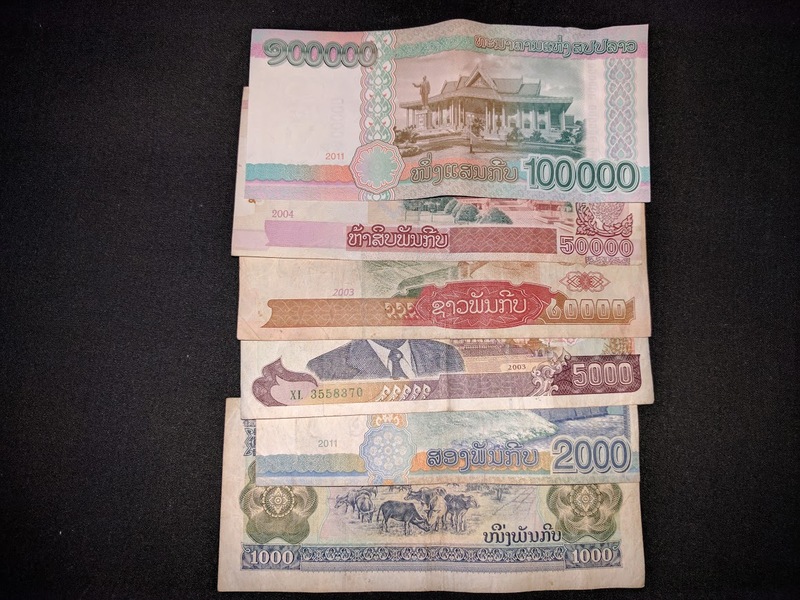 Kip (LAC) is the Lao currency and 8,200 Kips equal One US Dollar! Wow … that’s a lot of zeros! 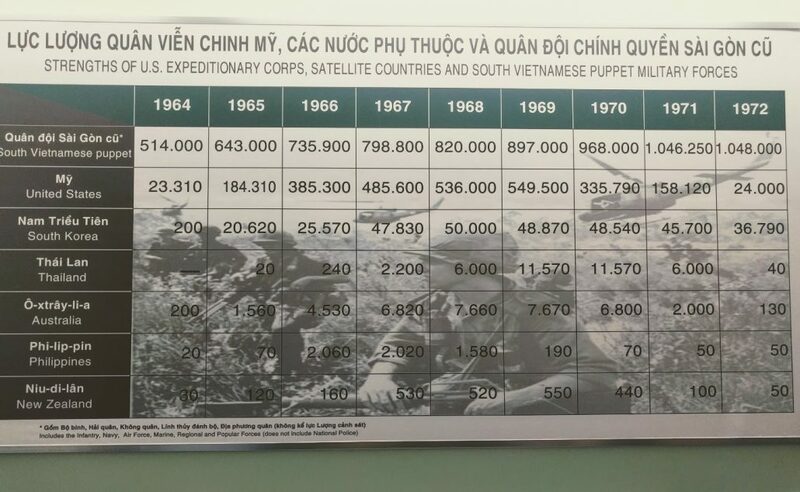 Laos played a role in the Vietnam War and according to Wikipedia “Between 1964 and 1973, the U.S. dropped two million tons of bombs on Laos, nearly equal to the 2.1 million tons of bombs the U.S. dropped on Europe and Asia during all of World War II, making Laos the most heavily bombed country in history relative to the size of its population”. Vast areas of the country are impossible to cultivate due to unexploded bombs which continue to cause death and injury to people. Luang Prabang is known as one of the best-preserved towns in Southeast Asia and was awarded the UNESCO World Heritage status in 1995. 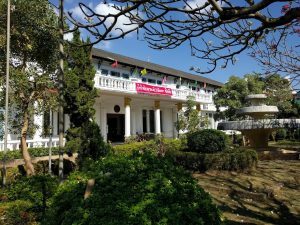 The architecture is a combination of traditional Lao Teak houses and French colonial mansions, many of which show the effects of time. 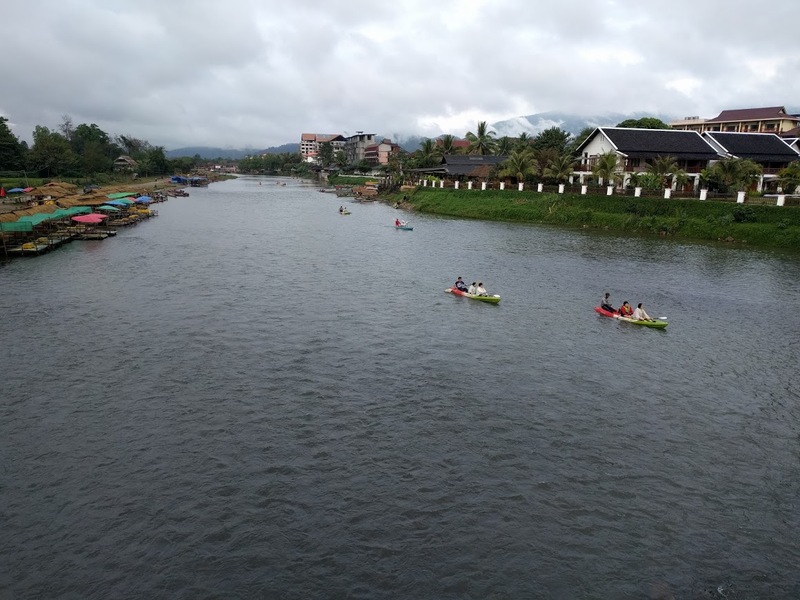 The town is situated in a valley at the confluence of the Mekong and Nam Khan rivers and attracts backpackers and outdoor enthusiasts with its wide variety of activities, as well as those interested in textiles and architecture. The French influence is obvious and the vast majority of the visitors we came across were from Europe, particularly France. We also met a lot of Australians, as we did in Thailand. One of the first things we noticed was that more Lao people speak English than the Thais in Chiang Mai. 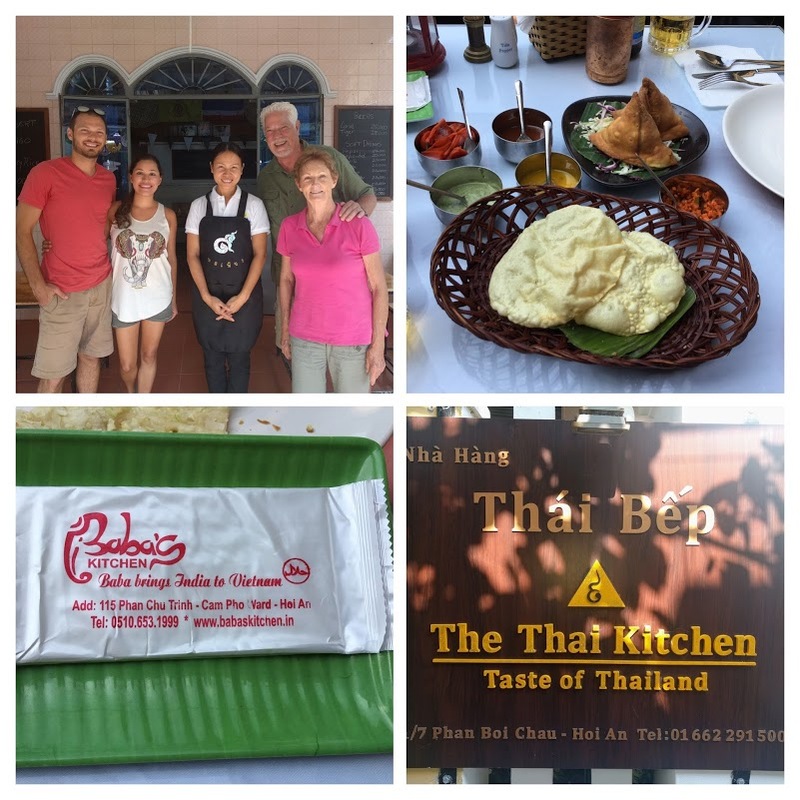 Also, many of the restaurants offer delicious French style breads and bakeries and even Lao restaurants serve Western type dishes. The prices are quite a bit higher than in Chiang Mai where we ate lunch for the two of us for around $3! Here breakfast can cost around $10 for two – that’s with a large, delicious up of cappuccino! However, the Night Market food prices are on a par with Chiang Mai. 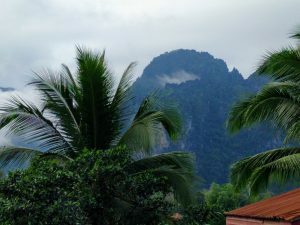 Luang Prabang is, without doubt, the premier tourist destination in Laos and has the reputation of being the heart of Lao culture and religion. All this adds up to inflated prices apparently unknown in other parts of Laos – we’ll see if this is true as we travel south. 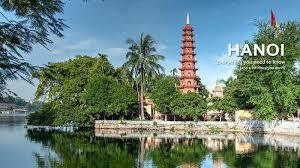 The normal stay for tourists is 2.8 nights. We initially booked a guesthouse online for two nights but were not pleased with it. 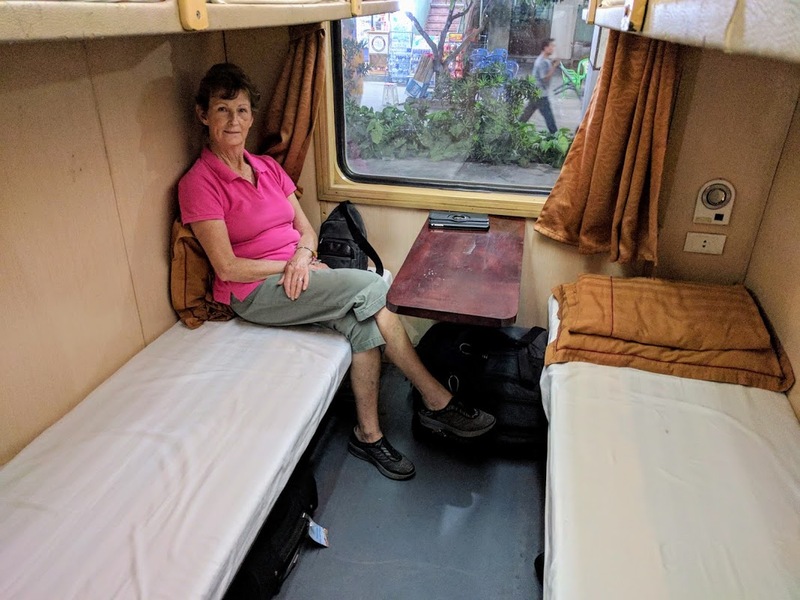 So, on our first day we familiarized ourselves with the layout of the town while checking several guest houses, ranging in price from $12 a night (recommended by a young Canadian couple) to $25 per night which had the bed against the wall so one of us would have to climb in! We soon found a very nice place for $30 per night. 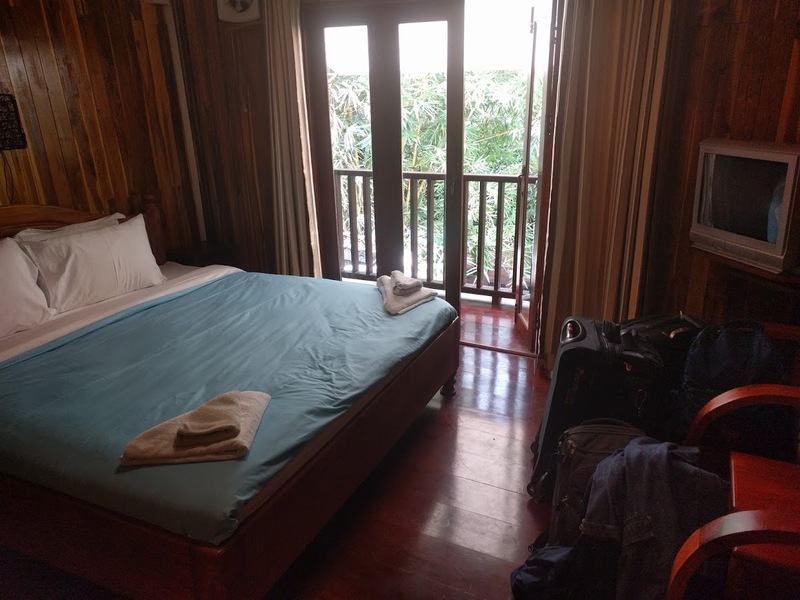 Remember, in Chiang Mai we were paying $14 a night! The house is an attractive traditional Lao style house made of teak. Our room was large with a very comfortable King bed and a modern bathroom. We booked for a week. One problem was that there was no closet to hang our clothes. We assume backpackers don’t need to hang anything up! And the other was weak WiFi. However, the staff was friendly and the location was perfect. We left Chiang Mai in the rain and the cloudy, cool, wet weather followed us to Luang Prabang. In fact, we only had 1 day of sunshine during our stay which is most unusual for this time of year. This did not deter us from the sightseeing we had planned to do and we were soon in the laid back mood of the country where PDR is known as Please Don’t Rush! We’ll catch you up on our sightseeing in our next blog. Wat Prathat Doi Suthep is the most famous temple in Chiang Mai and we visited it one morning in late December. This site is always busy with lots of tourists visiting and since it was high season and close to the Christmas Holidays we encountered even bigger crowds. 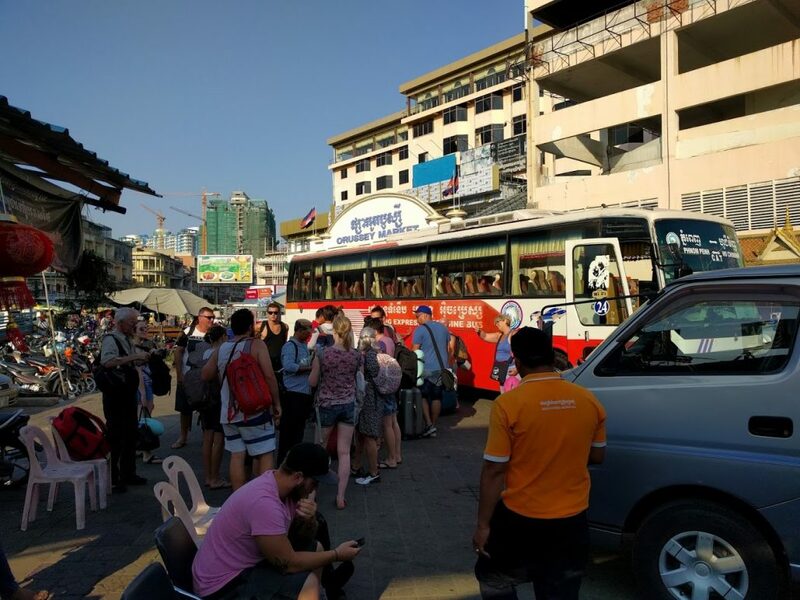 The road and parking lots were congested with tour minibuses, red buses (songthaews) brown buses, delivery trucks, scooters and bicycles (yes, people do ride bikes up there from Chiang Mai!) And there are the inevitable hawkers, some quite aggressive, pushing bells and other trinkets into your face as you attempt to get into the temple! We bought our tour tickets (Baht 600 or $16.60 each) through a local travel agency in our area. The price was less than several other companies we checked on so we were expecting a “standard” tour which, in fact, was what we received! 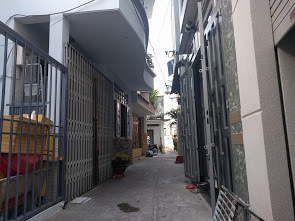 We arranged to be picked up outside our apartment building at 8:45am and received a call just after 9am telling us the minibus was just a short distance away. With the traffic in Chiang Mai, it’s not easy to estimate arrival times, so no problem! It was a beautiful, sunny, cool morning – perfect for a trip out of town. The minibus was almost full of passengers who had been picked up earlier so we had the seat in the back to ourselves. Normally four people would be seated here so it was nice to have a little more room. Remember, tour buses in Southeast Asia are built for small Asian people, not big Westerners! 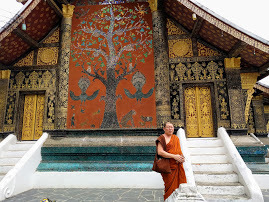 The tour included a stop at a Hill Tribe Village but some of the passengers were visiting the Royal Palace and we opted to do that instead of the village. 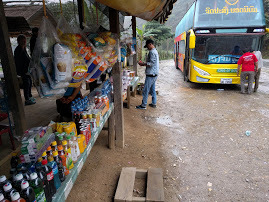 Having seen two working villages on our Northern Thailand Tour, we didn’t want to do a repeat, particularly since we felt it would be more geared to tourism i.e. selling souvenirs (which we found out later was the case!) 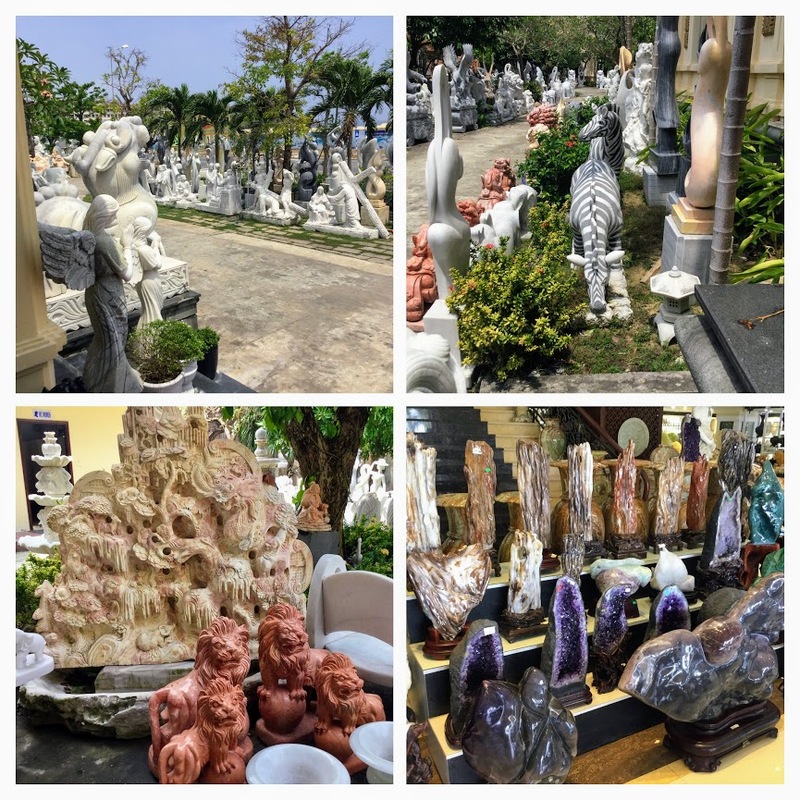 The admission to the Royal Palace was Baht 50 each and we enjoyed an hour walking around the beautiful grounds before being picked up for the short drive to the Temple. It’s a 15 kilometer drive from Chiang Mai to the temple on a very windy road that reminded us of our drive to Pai and Mae Hong Son. The temple was built in 1386 and expanded over the centuries. 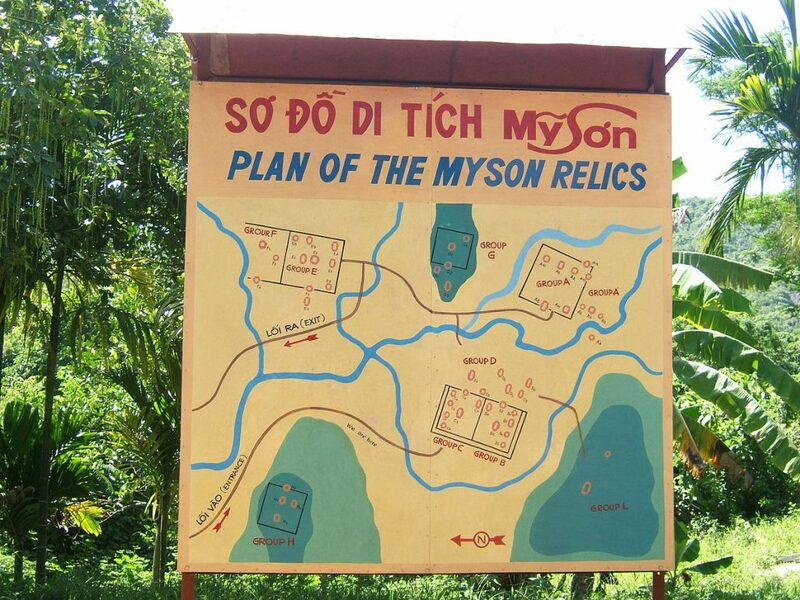 Construction of the temple would have been extremely difficult because the current road was not completed until 1935 and the only way to reach the site was through the jungle. Once we reached the temple complex, which sits at 3,542ft (1000m) above sea level, we had a choice of walking up 300 stairs, guarded by Naga (snake) figures from the 16th century or taking the cable car. For us it was a no-brainer! After a short briefing by our guide we went to the lower terrace for a panoramic view of Chiang Mai which, unfortunately, was very hazy. 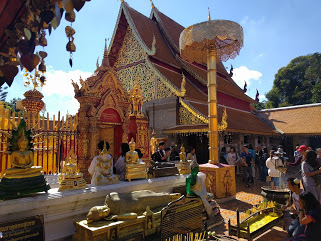 After taking our shoes off, we moved on to the upper terrace and walked around the dazzling gold-plated chedi, among the many small shrines, Buddha statues and beautiful golden umbrellas. All the colors were enhanced by the brilliant sunshine. People were praying, chanting, lighting candles, ringing bells and the smell of incense wafted through the air. Although there was a lot of activity, there was also a sense of peace and calm. “According to legend, a magical relic multiplied itself just before it was enshrined at Wat Suan Dok in Chiang Mai. A suitable place therefore had to be found to shelter the new relic. What better way to end our article with that wonderful story! We’ll be back with more about Chiang Mai later.